One of the most defining characteristics of the Boston Terrier are its ears. The breed's ears stand up straight and are likened by some to those of a bat. To no surprise, bat related names are common among Boston Terriers. Dayak, Dusky, and Talaud are a few names taken from the flying mammal variety. Baseball bats also provide several name options with Easton, Rawling, Wilson, Slugger, and Mizuno leading the pack. Some ideas borrowed from actors that played a role as Batman include Lowery, Keaton, Kilmer, Clooney, and Bale. Famous vampires are also popular name choices among Boston Terriers. A few vampire dog names include Count, Vlad, Alice, and Spike. The breed originated in Boston, a city providing plenty of unique names. Fenway, Sox, Celtic, Bruin, and Blazer are dog names coming from Boston sports. Ideas from famous Boston natives include Samuel (Samuel Adams), Franklin (Benjamin Franklin), Poe (Edgar Allan Poe), and Winchester (Oliver Winchester). 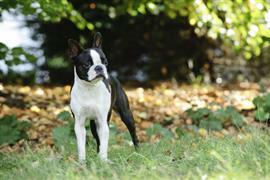 Boston Terriers are descendents of a dog owned by Robert C. Hooper (known as Hooper's Judge). Judy, Mathis, Lane, Cardozo, Posner, and Burger are interesting picks derived from famous judges. Some of our pages will contain a subcategory. A subcategory is a slightly more specific grouping than the main topic of the page. For a subcategory, we will include a separated table of names and corresponding descriptions. An example of a subcategory of Red Dog Names would be 'Dog Names Inspired by Red Wines'. If you have any subcategory ideas for the Boston Terrier Names page, we would love to hear them. Use the form below to submit your ideas.